A large number of pictures of Anchor buildings are not identified, either as to the builder or the original designer. 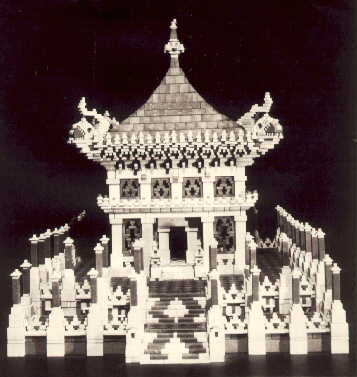 Shown on the left is a picture of an 'oriental temple'. Although I have seen pictures of a similar building in the Anker Zeitung (Anchor Magazine) from the 1920s, I have no identification on this picture. It is with great sadness that the CVA notes the recent death of Arlan Coffman. Arlan had a wonderful collection of antique toys. About a third of the Katonah (NY) exhibition came from Arlan's collection. Richter's Anchor Stone Building Sets (Richters Anker Steinbaukasten) were the world's most popular construction toy from the early 1880s through W.W.I. These building stones were made in Rudolstadt (new), Thuringia, Germany, (and at the company's branches in Vienna, New York and, possibly, St. Petersburg, Russia). Starting in 1880, Richter's Anchor building stones were covered by international patents and trademarks. The CVA has published its Stone Catalog, which covers all of the stone shapes Richter made, plus shapes made by other innovators. Metal parts and most other accessories are included in the catalog. The contents of the sets are also listed. The cost of the catalog sheets (European size paper, intended for loose leaf use) is f 40, plus postage costs, in Europe. I bought four copies at the recent spring meeting, along with European four hole binders. The cost, including postage, will be $40. All Anchor people need, and will want, a copy. Owners of earlier copies of the CVA Stone Catalog should contact me. I brought back replacement pages for the catalogs already sold. This is the second set of replacement pages. As before, the replacement pages are free. Web Page Notes: Most subpages do not change from month to month. I have decided to add the note "(new)" after those subpages which have changed recently. The "builder's page" and "my page" are revised every month. A few people have asked me to number the "issues" of the Anchor page. Well, they started in August, 1996, so this "issue" is Vol. 3, # 5 (with Vol. 1 starting with # 8, to keep the number of the month the same as the issue's number). For the month of May, 1998. You are visitor number to the Club of Anchor Friends' home page since the hit counter began to work on February 6, 1998. From the first appearance of the Anchor home page, August 30, 1996, there has been a slow but steady increase in the number of people accessing it. During the first year the Anchor page had more than 3,000 visitors and during the fall of 1997 the page was averaging 25 hits a day. The hit rate has dropped to about 10 a day now, partially due to the after Christmas season and partially due to the change of ISPs. I have been updating this site monthly since August, 1996.